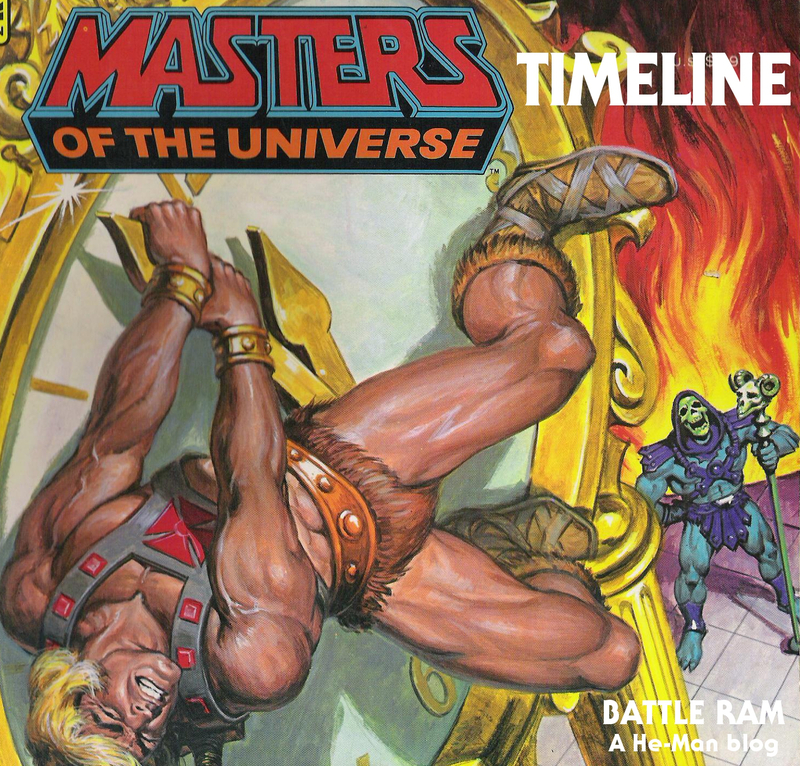 In my continuing quest to understand the history of the vintage Masters of the Universe toyline, I’ve put together the following timeline. 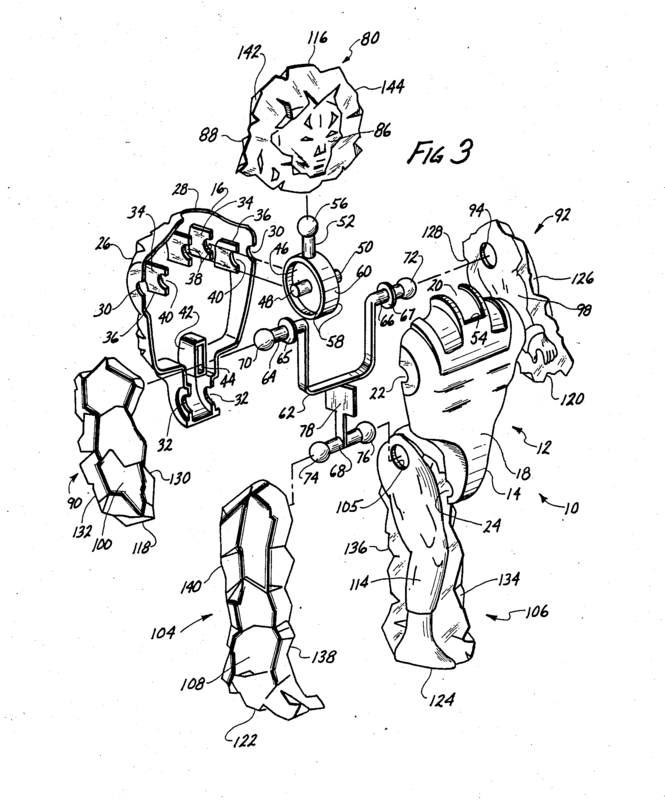 It’s generally focused on toy design, drawing dates from concept artwork, internal Mattel documents, patent filings, trademark filings, and even the Masters of the Universe Bible. 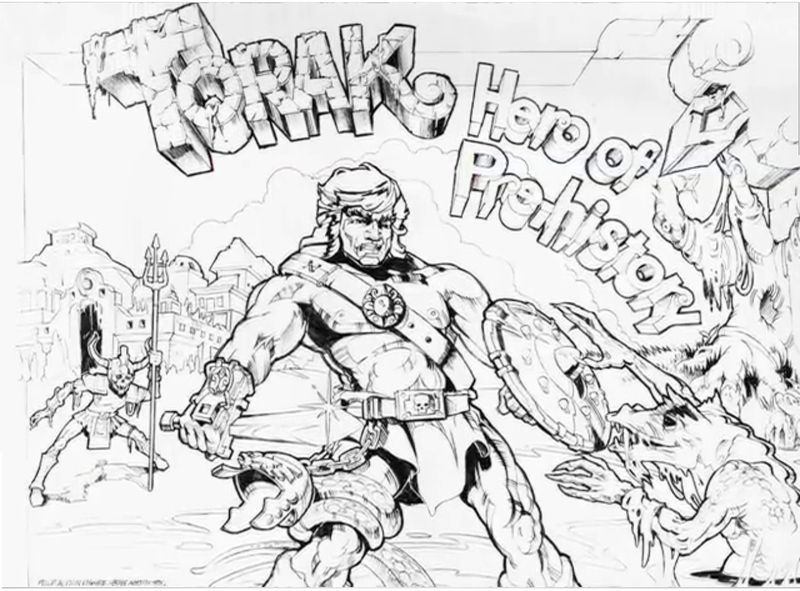 My goal here is to give readers a sense of how the He-Man toyline developed and evolved. I’ve also included a few dates gleaned from the CPI (Conan Properties International) vs Mattel court cases. 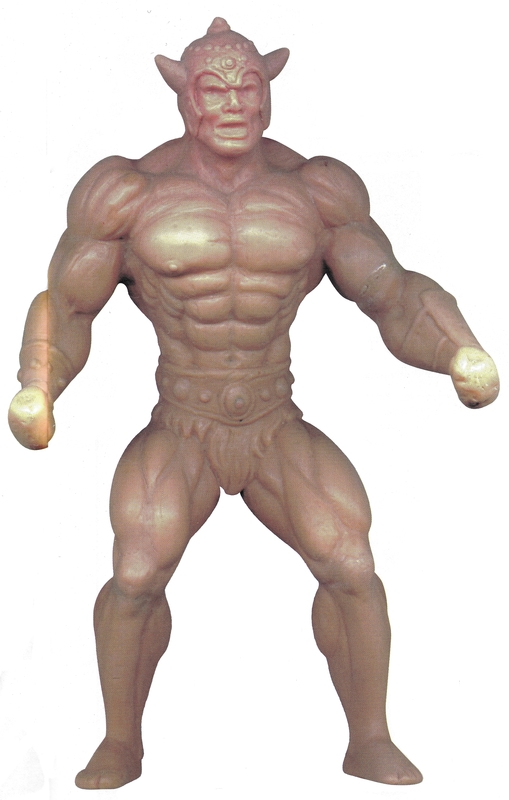 I believe this will help put to bed the idea that He-Man started out as a Conan figure. 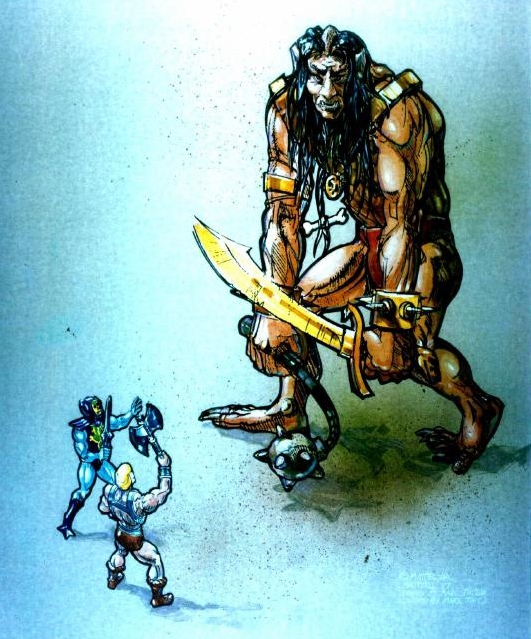 While He-Man was certainly influenced by Conan as depicted by Frank Frazetta, the He-Man project predates Mattel’s work on the Conan property by some time. Additional information provided by Miguel Á. This is by no means an exhaustive timeline. I included only those pieces of information that were dated in some way. That includes information from court cases that was assigned an approximate date, like an early 1981 date for Tony Guerrero’s He-Man prototype. That also means that undated material like Mark Taylor’s Demo Man concept or Roger Sweet’s Mekaneck concept are not included in the timeline. I could of course infer dates for this kind of material, but I wanted to avoid guessing and stick to known facts. I also have stayed away from dates tied to media not directly related to toy production. There are many specific dates available for individual episodes of the Filmation He-Man cartoon, for instance, but that is really outside of the parameters of this particular project. 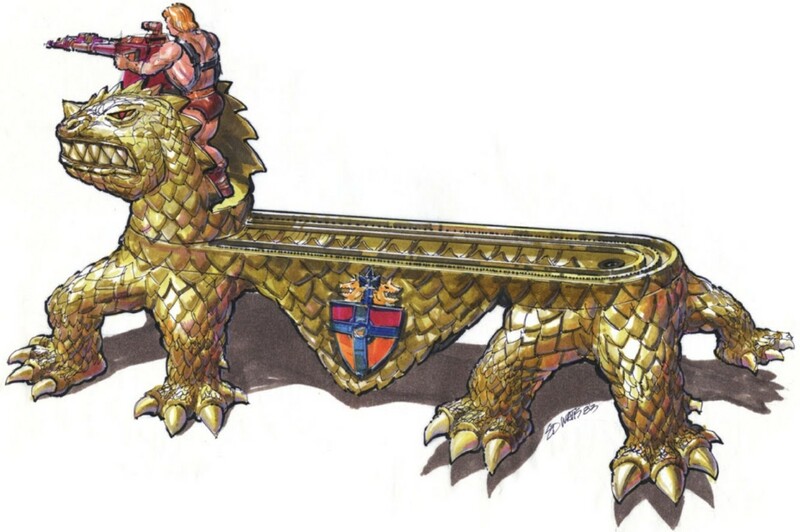 I have only included a few images of concept designs here – some of them appear in earlier posts in this blog, and almost all of them appear in the sources I drew from. Unfortunately it would not be practical to try to include all of them in this post. Finally, I’ve included some names that were listed in the Masters of the Universe Bible. The Bible itself is dated December 1, 1982, which gives us an early (if not exact) date for at least the conceptual existence of characters like Orko (or Gorpo, as he was first named) and Jitsu (or Chopper). Tony Guerrero’s early 1982 He-Man prototype. Image source: Tomart’s Action Figure Digest. 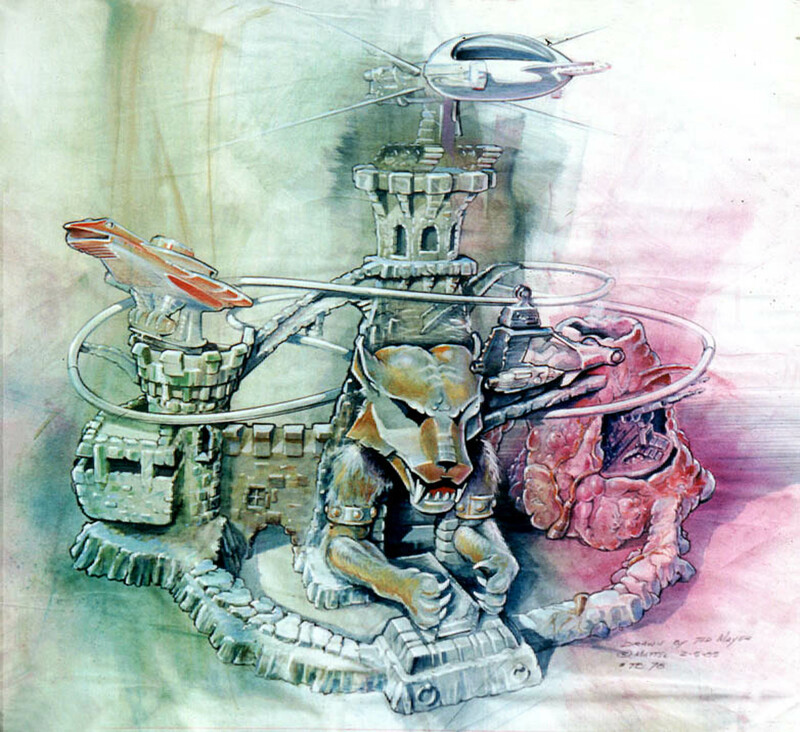 Dragon Walker concept by Ed Watts, 1983. Image source: The Power and the Honor Foundation. 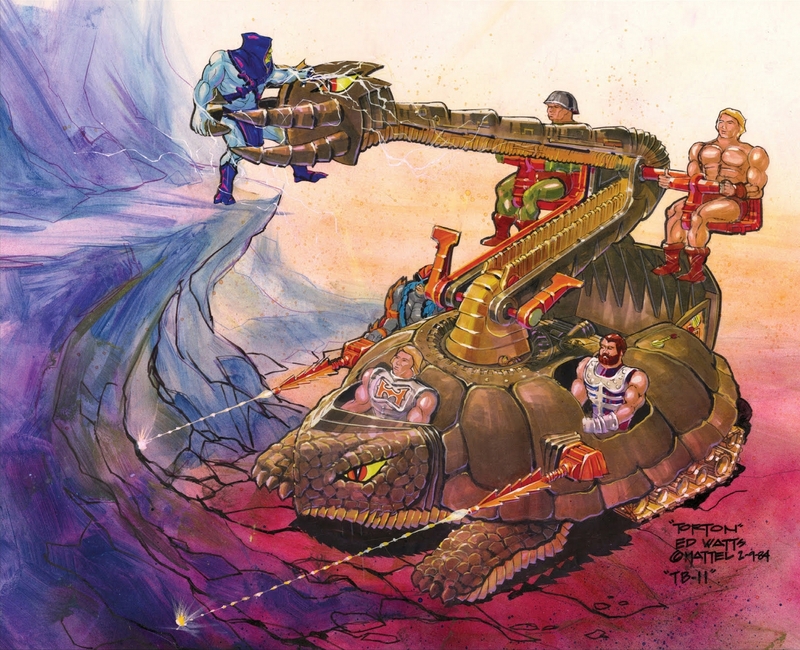 Eternia concept #2, by Ted Mayer – February 5, 1985. Image courtesy of Ted Mayer. Thanks to Shawn for pointing me towards the CPI vs Mattel material. 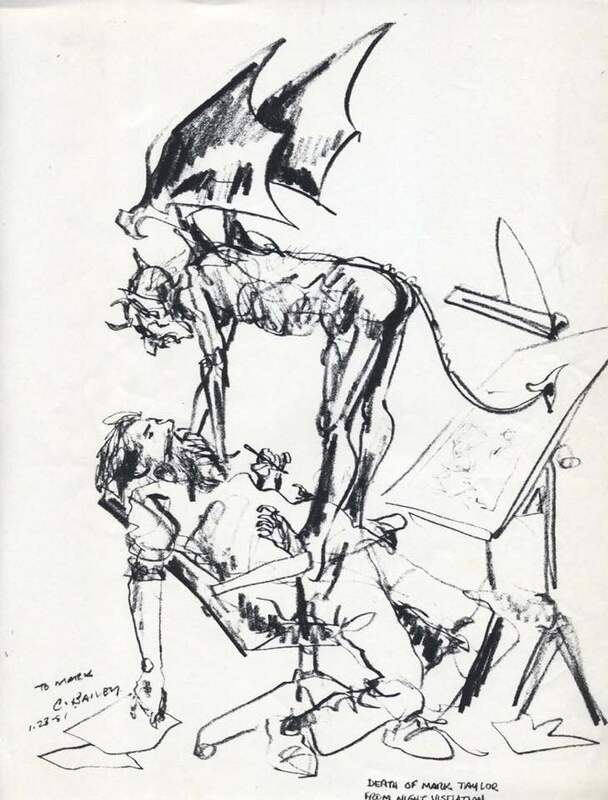 “Death of Mark Taylor From Night Visitation.” Artwork by Colin Bailey, January 23, 1981. 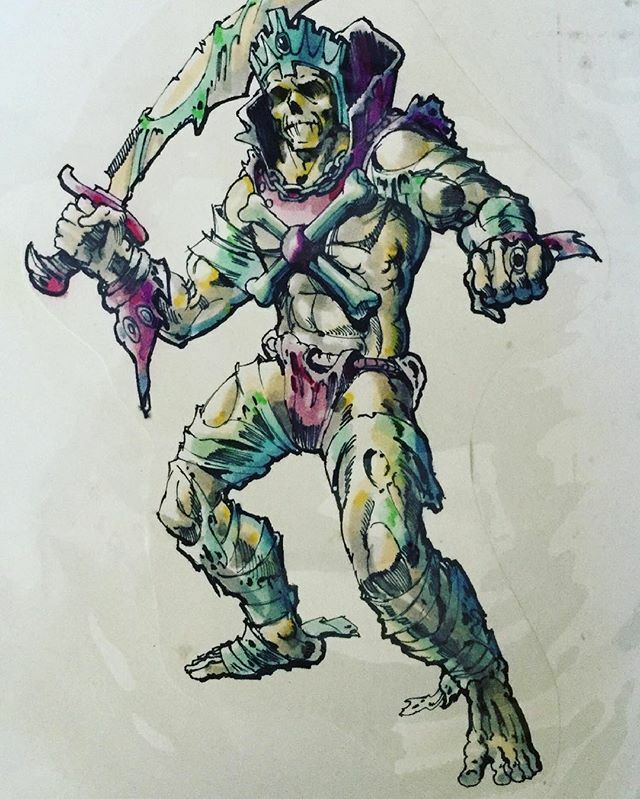 Given to Mark when he was working on his “dark project” (He-Man). Image courtesy of Rebecca Salari Taylor. Hopefully it’ll also help educate some people in the ways some things work. Some things take time. Sometimes a designer will design a bunch of toy concepts but only some will be picked up. Later, some of the others may be tweaked and released. Sometimes they have a name they love, they trademark it but the toy doesn’t come for some time. 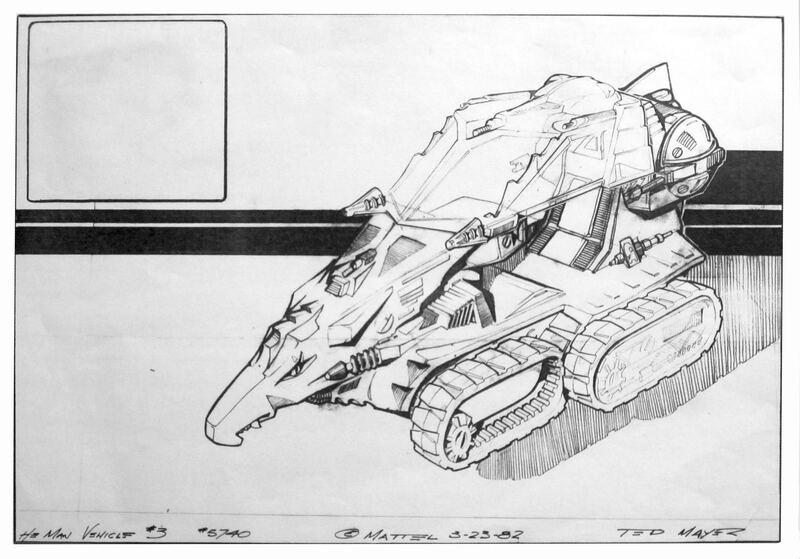 In this, you can see things like the concept for Megator was 84, tweaked/redeisned the concept again a year later in 85 then wasn’t gone back to for 2 more years. In Transformers, a famous case would be Fortress Maximus. The name was first planned to be used for the 85 released toy that became ‘Omega Supreme’, then for then for Autobot city/Metroplex (86), finally used in 1987. 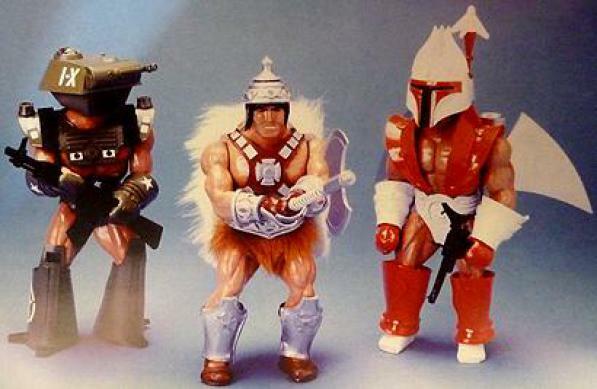 We can see in MOTU, Roton’s name was trademarked long before they even designed the toy. Thanks Manic Man! Also thanks for heads up, I fixed the duplicate Faker reference. There’s a few names I don’t recognise – Tyroar, Cyclo Marauder, Slime Monster, Slasher – but mostly I knew everything, so it made me feel knowledgeable too, bonus! Thanks very much! This was quite a project. Much of the data comes from the Power and Honor Foundation Catalog, in addition to the other sources I named. Very informative. I have a problem understanding one part. I have a Stinkor with Mattel and 1981 on it. On the timeline it shows he doesn’t appear until much later. Hi Greg. Great question. Stinkor reuses existing body parts from Skeletor/Mer-Man, so the older date is stamped on him. However, he first shows up in Mattel’s 1985 dealer catalog.